Drink to gin’s fascinating medicinal history as you enjoy cool cocktails in these clever Copa glasses. Drink to gin's fascinating medicinal history in style with these clever Copa de Balon glasses, which are designed with a large bowl to trap the spirit's botanical aromas and slow the melting of ice. Each is printed in platinum metallic ink with a classic saying that speaks to the value of a stiff drink: "GOOD FOR WHAT AILS YOU" comes from sailors who added gin to lime juice to combat scurvy, and "FOR YOUR HEALTH" from 19th century British soldiers, who put gin in tonic water to cover up the bitter taste of quinine, used to prevent malaria. 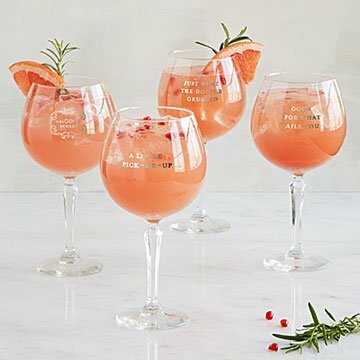 Fortunately, tonic is tastier than it used to be, and these glasses provide ample room for gin, ice, and mixers— so go ahead and enjoy a healthy dose of your favorite gin cocktail. Designed by Patricia Carlin. Glassware made in the US. Decorated in Lawrence, Kansas.